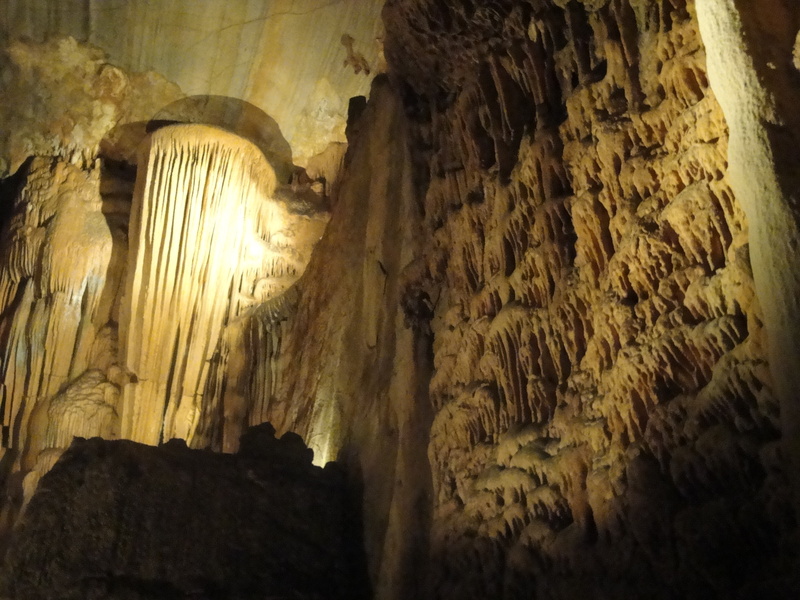 After braving the Snake we headed straight for the Bristol Caverns. We purchased two tickets into the caverns at a gift shop that probably hasn’t been renovated since the 1970s and soon were heading to the cave entrance. We had a small group, just four people. The group after ours had 20+ including some kids–we lucked out! Our guide marched us along a short trail through the woods, pausing to show us a hole in the ground that had been used by Native Americans fleeing the white man back in the 1800s. The Native Americans used to slip through the hole and into the caves, using vines to climb 180+ feet along slippery, wet walls to the cave floor below. Terrifying! We took a much less acrobatic route into the caves. As we passed from the outdoors into the cave entrance the temperature dropped a good 25 degrees–we went from a muggy 85 degrees to a cool 60 degrees and it was great. The (white) man who originally found the caves (back in the 1800s I think) used it as a fruit cellar and charged his neighbors for produce storage. Smart! 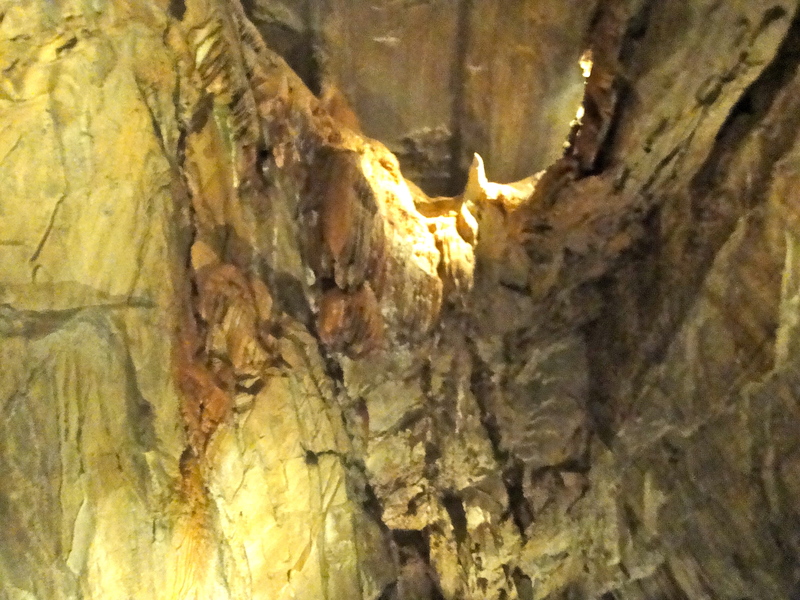 The caves are divided into upper and lower levels. The upper level has a room that past mayors of Bristol used for meetings during the summer–much cooler before the days of A/C. 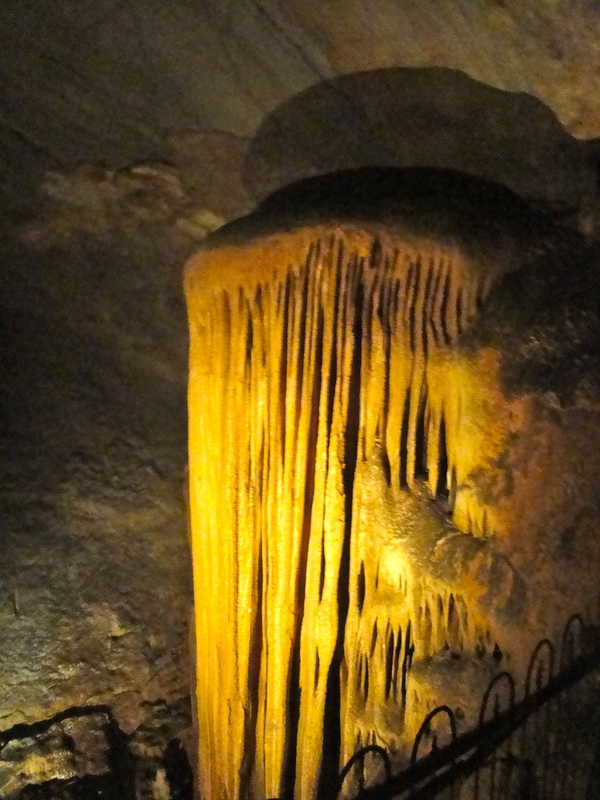 The caves are extremely beautiful and there are all sorts of geological formations that have formed over billions of years. Water is a powerful force but it moves incredible slowly. 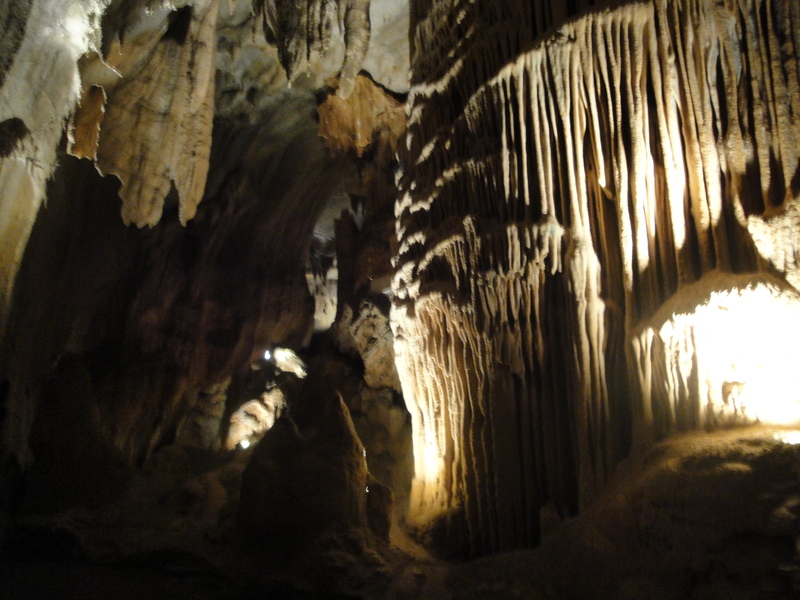 It can take thousands of years for a large stalactite or stalagmite to form. Some smaller formations are already hundreds of years old. The whole thing makes one feel pretty insignificant. The Bridal Veil Formation, seen above and below, looks like a frozen waterfall. Water, the great destructive and creative force! Much of the rock is still “live,” meaning that it is still growing and changing via the forces of nature. There’s a strict no touching rule, as the slightest human intrusion can severely damage a developing rock formation. 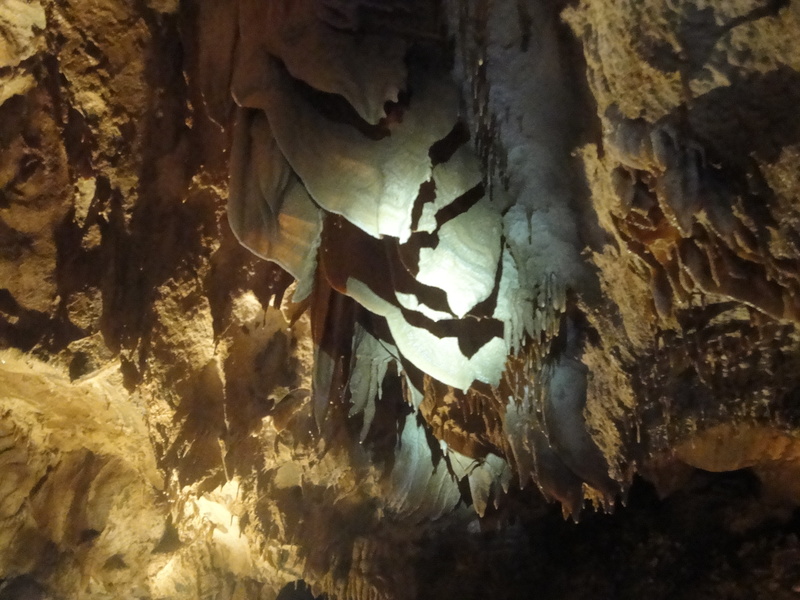 The caves are lit extremely dramatically via a series of hidden lights. 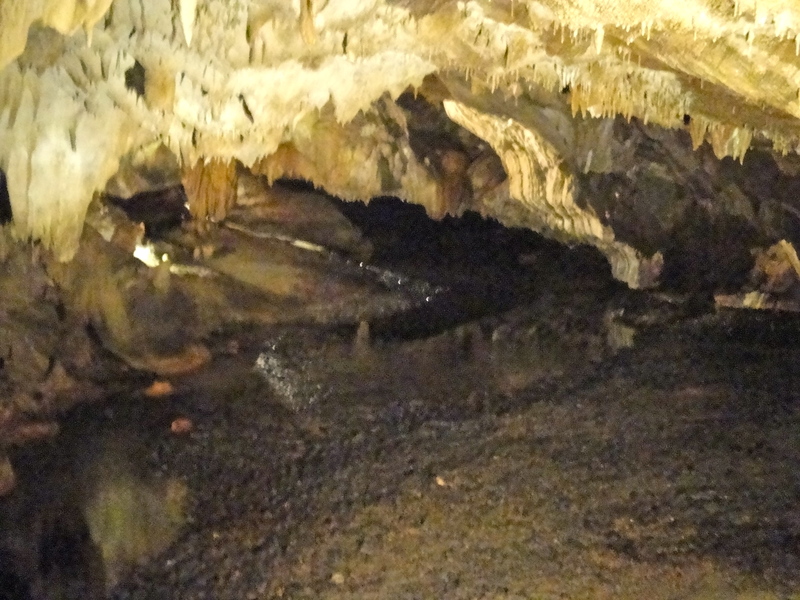 The river that flows through the caves is visible on the lowest level of the caves. At one point it streams off into the darkness, which conjured images of horror movies like The Cave. That movie was set in Tennessee right? This rock formation resembles Snoopy up on top of his dog house. Hard to see from this angle, but he’s there! 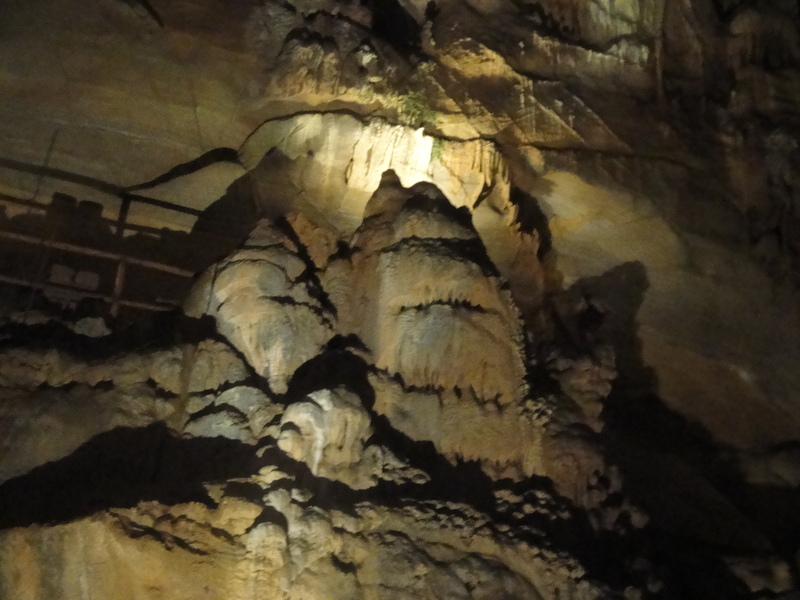 I love caverns and cave formations and geology and time doing its thing and all that, so I found the Bristol Caverns fantastic. This was a great way to spend a lazy afternoon in the mountains.